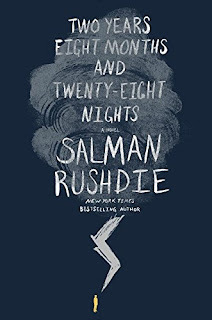 In Salman Rushdie's first novel for older readers in something like seven years—an onion-skinned thing at once wise, wilful and winningly whimsical—a great storm signals the end of the world as we know it. A state of strangeness reigns in the wake of this otherworldly weather. Lightning springs from fingers; a would-be graphic novelist dreams the superhero he conceived into being; an abandoned baby bestows "blemishes and boils" on those who tell tall tales in her pint-sized presence; meanwhile, an elderly gentleman who calls himself Geronimo wakes up one day able to levitate: which all sounds quite delightful, doesn't it? Don't be fooled, folks. Many will perish in the next two years, eight months and twenty-eight nights. Wars will be fought and an awful lot—not least lives—will be lost. But every ending has a new beginning built in, and perhaps a better world will arise from the ashes of the last. 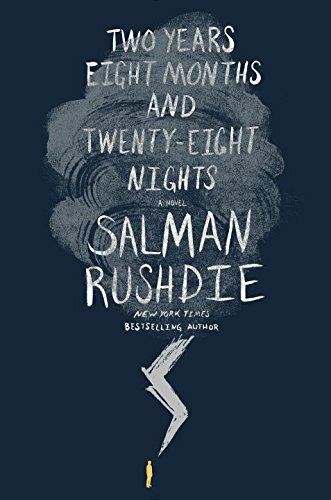 Maybe Rushdie's plea for a future "ruled by reason, tolerance, magnanimity, knowledge, and restraint" will be accepted rather than outright rejected. Stranger things have happened. The overarching narrative of Two Years Eight Months and Twenty-Eight Nights (hereafter just Two Years, if you please) is an encapsulation of exactly that argument—between the rational and the unreasonable. Representing these opposing perspectives are two long-dead men: the intellectual Idb Rushd and Ghazali of Tus, a sinister, fire-and-brimstone figure whose irrational rhetoric made a laughing stock of the aforementioned philosopher. But Rushd's life was not all strife. For a little while, when he lived—a millennium or so ago, don't you know—he loved, and was loved by, a beautiful woman called Dunia who bore him many children. Being a man of reason, he did not guess that she was a supernatural creature, a jinnia, of the tribe of female jinn, the jiniri: a grand princess of that tribe, on an earthly adventure, pursuing her fascination with human men in general and brilliant ones in particular. Generations later, in the present day, their disparate descendants—all one thousand and one of them—are all that stands between humanity and the dark jinn that declare war on the world at the behest of the disgusted dust that was once Ghazali. Stories were enfolded within other stories and contained, folded within themselves, yet other stories, so that the story became a true mirror of life [...] in which all our stories contain the stories of others and are themselves contained within larger, grander narratives, the histories of our families, or homelands, or beliefs. Chimeras or angels, heaven or hell, metamorphoses or transfigurations, a pox on them all, he had always thought. Solid ground beneath his feet, dirt under his fingernails, the husbandry of growing things, bulbs and roots, seeds and shoots, this had been his world. Then all of a sudden, levitation, the arrival of an absurd universe, strangenesses, cataclysm. [...] He didn't want to know what it meant. He wanted not to be a part of the place, the thing, he didn't have a word for it, in which all that existed, he wanted to re-create the real world around himself, even if the real world was an illusion and this continuum of the irrational was the truth, he wanted the fiction of the real back. 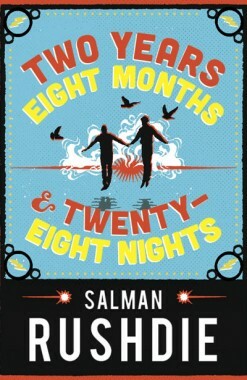 But of course we cannot go back, much as we might like to—as Rushdie reminds Two Years' readers repeatedly. We can only go forward, carrying in our hearts and our heads the knowledge of what was, warts and all, the better to make what will be the best it can be. The doors of perception opened and he saw that what was evil and monstrous about the jinn was a mirror of the monstrous and evil part of human beings, that human nature too contained the same irrationality, wanton, wilful, malevolent, and cruel, and that the battle against the jinn was a portrait of the battle within the human heart.